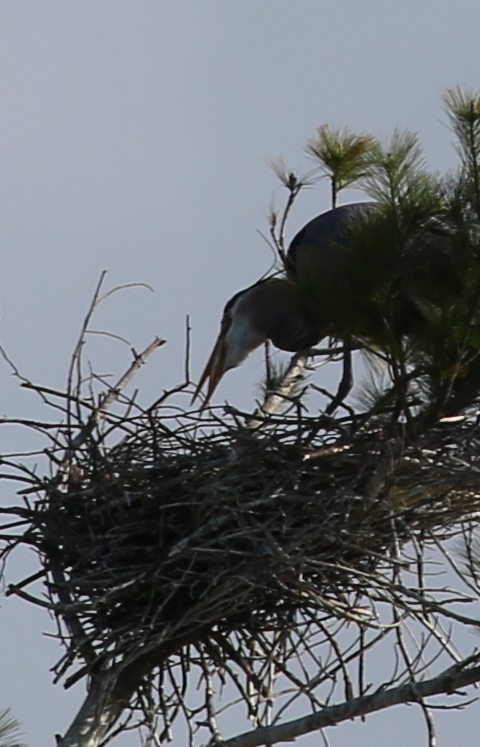 With chicks the size of Baby Huey stumbling around a flimsy treetop aerie, great blue heron parents spent the weekend reinforcing the nest. 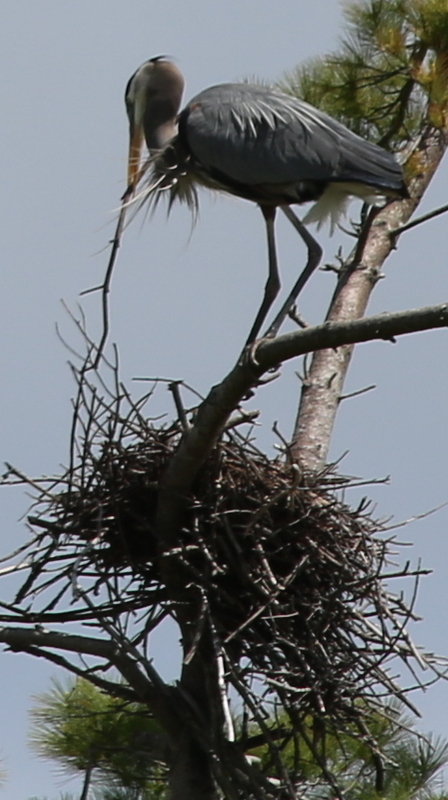 Each time dad returned to the nest with a new twig to add to the nest, mom greeted him lovingly, and the kids were simply amused by all the action. 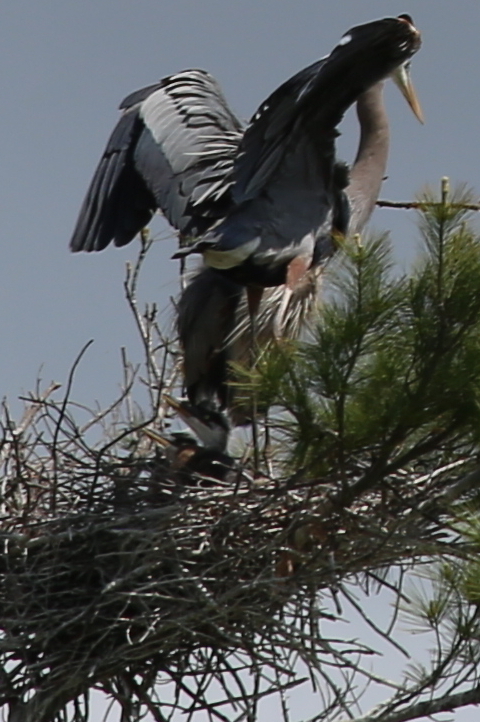 The chicks hatched on May 14; for details, see We Have Great Blue Heron Babies! 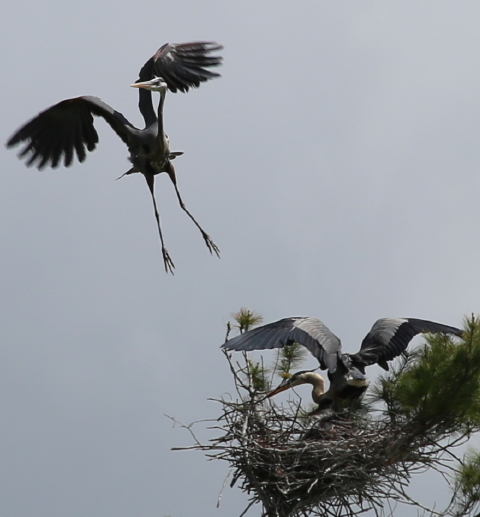 As though by magic, once the twig was passed to mom, dad lifted his wings and rose into the air. 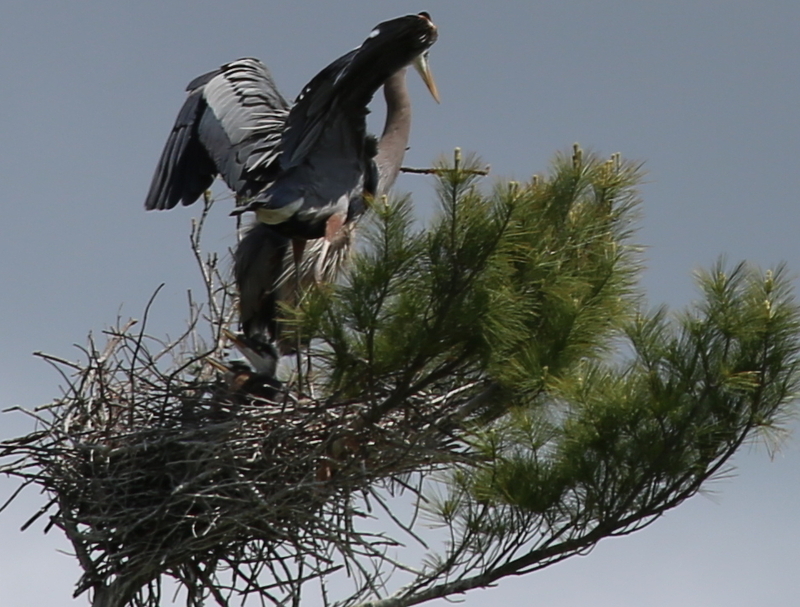 He glided silently to a nearby tree with an abandoned nest that he scavenged for building material. 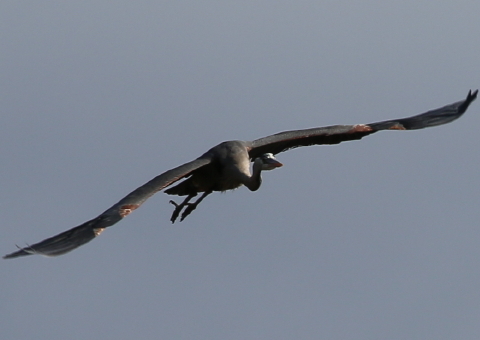 On a breeze and a thermal, dad floated back to his nest with another twig. 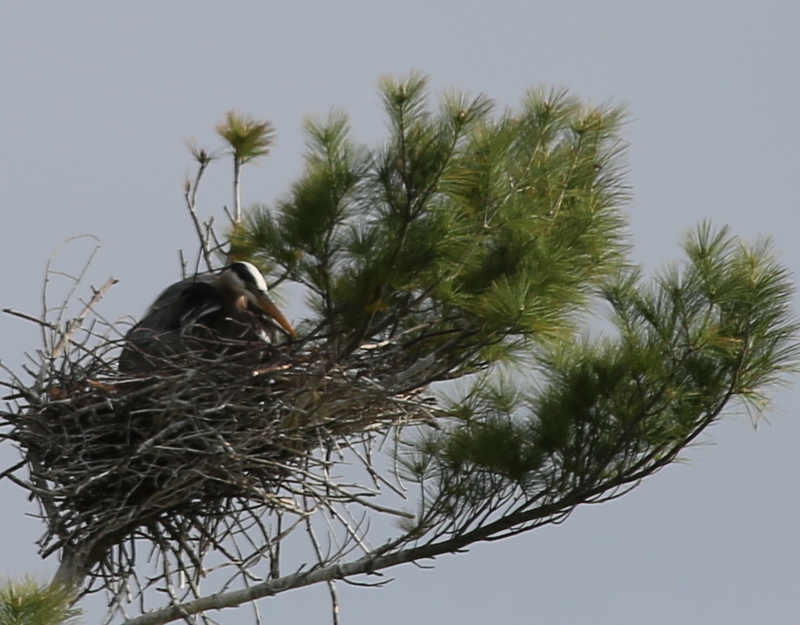 As mom and dad worked away, the kids settled down in the comfort of the swaying bough. 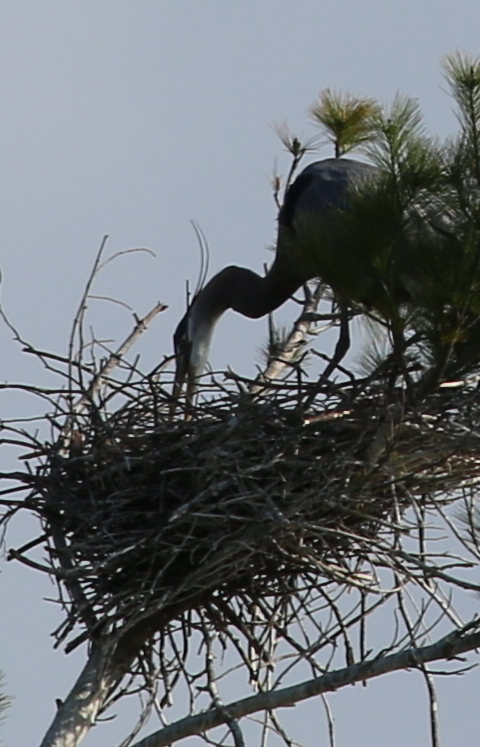 The parents continued all weekend, twig after twig, until the nest became sturdy enough to support their growing family. 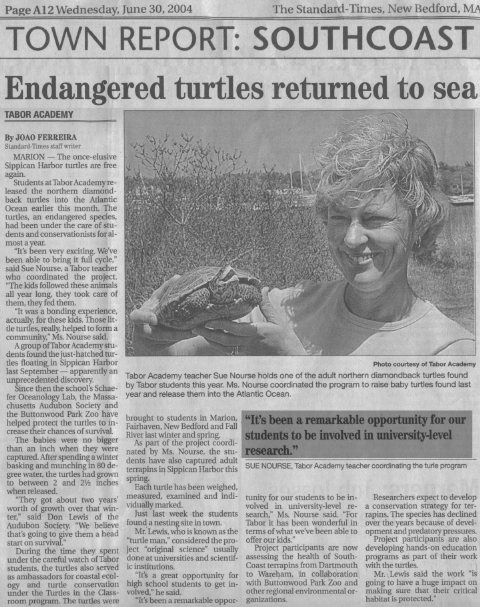 Every turtle has a story to tell and a lesson to share. 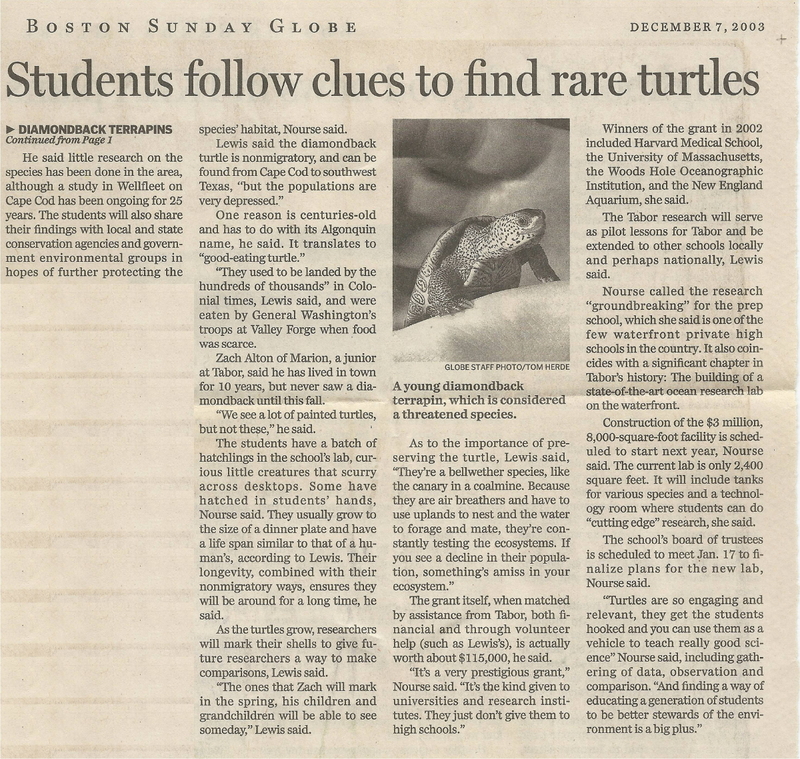 While researchers eschew bonding with wild animals, the truth is there’s always a special critter or two through the years that you remember fondly. 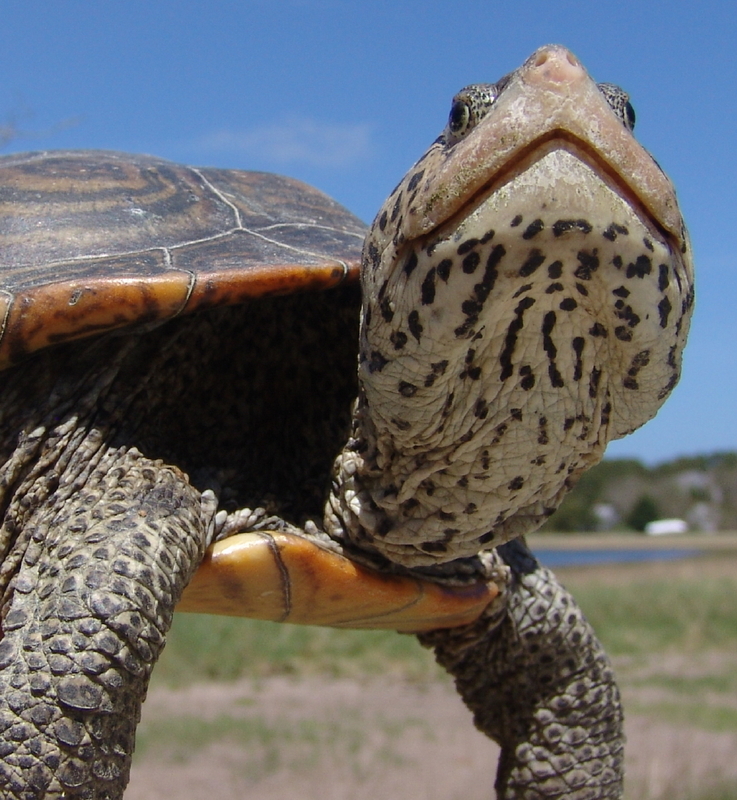 Female Terrapin #829 played such an important conservation role as the face of Cape Cod diamondback terrapins that she holds a special place in our hearts and minds. 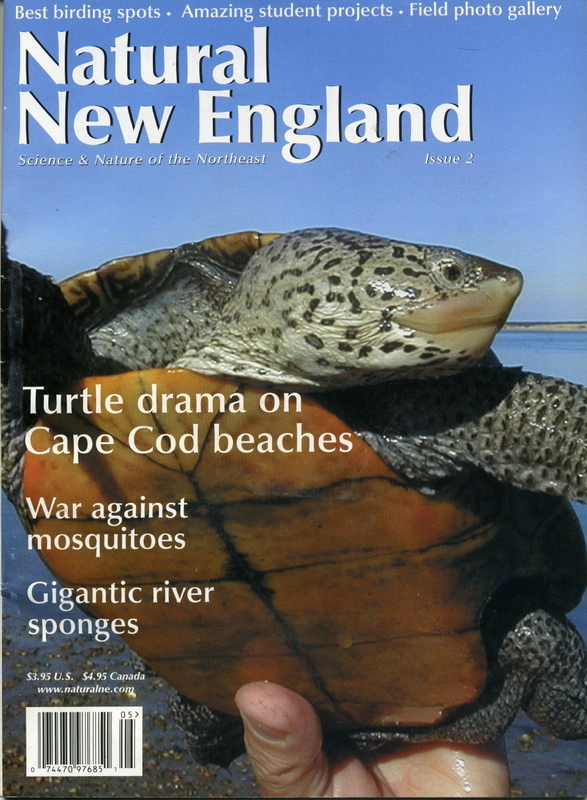 In 2000, her glossy photograph graced the cover of Natural New England Issue #2 to represent this species in trouble on Old Cape Cod. Her captivating beauty, which appeared in countless publications and multimedia presentations, helped inspire a community conservation effort that turned around the outlook for diamondback terrapins on the Outer Cape … and has helped preserve fragile coastal uplands and restore critical salt marsh systems. 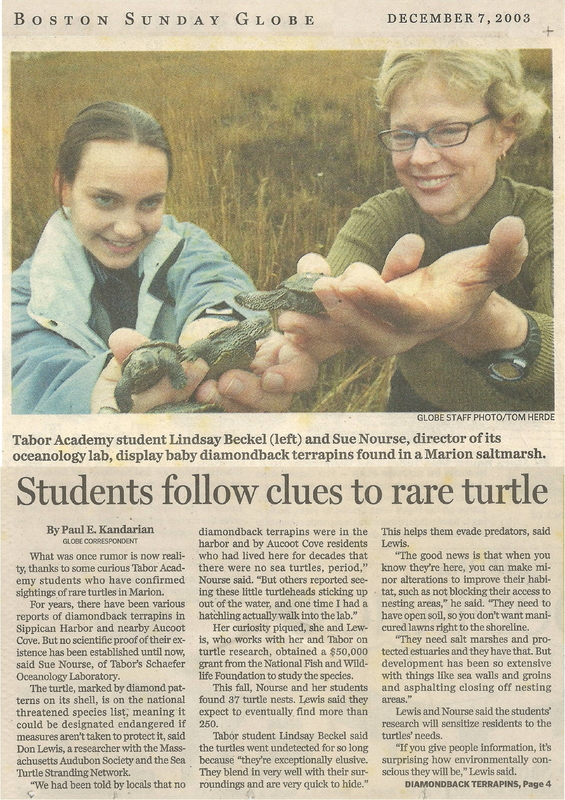 We chose Terrapin 829 for this role because of this wonderful photograph taken on the stunning brilliant day of her first capture on September 26th, 1999. 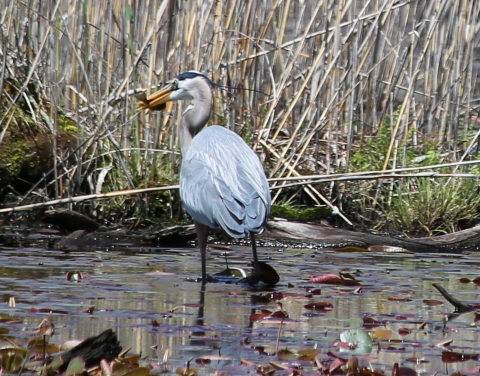 The backdrop is Blackfish Creek, Wellfleet Bay and Great Island in the far background. On this perfect fall day, as most Outer Cape terrapins were preparing to enter brumation, healthy Terrapin 829 weighed 1394 grams, her carapace measured 19.6 centimeters and her plastron spanned 17.6 centimeters. Based on our Outer Cape growth model, we estimate her age in 1999 as around 30 years. 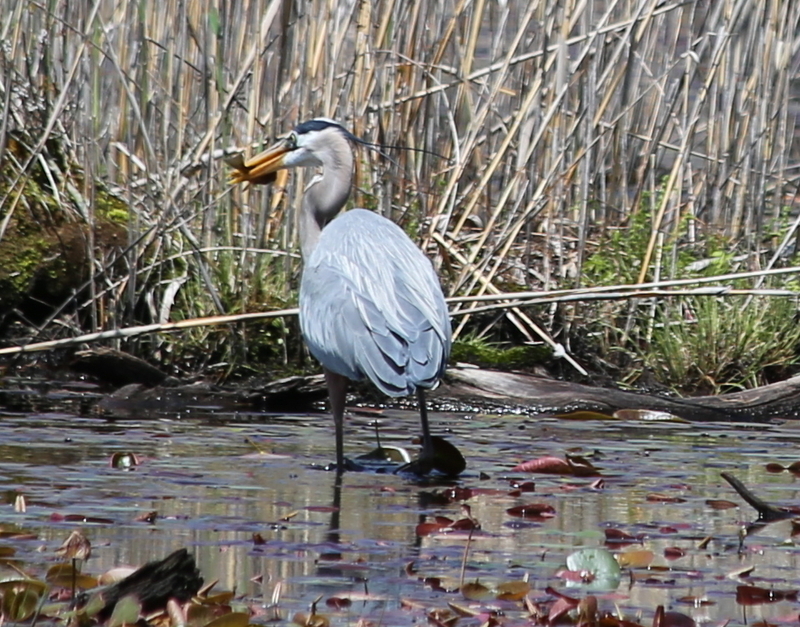 We captured Terrapin 829 from a kayak with a 10-foot dip net at 7:15 in the morning in her native Blackfish Creek. 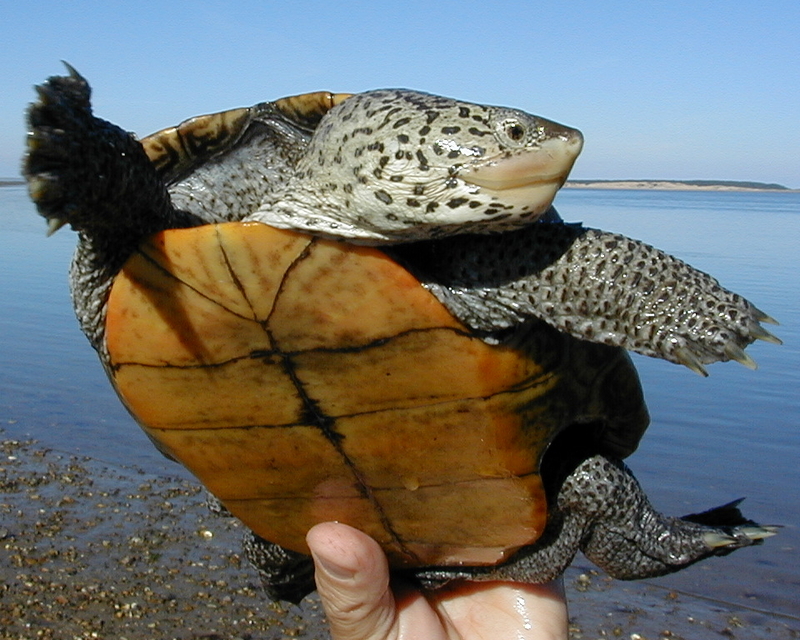 She was one of the first terrapins netted in this proof-of-concept approach that subsequently became the principal methodology for water captures on the Outer Cape and SouthCoast. 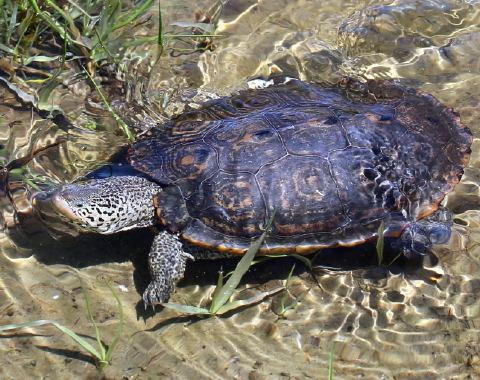 Terrapin 829 was also the next to the last active terrapin we observed in 1999; all others had already burrowed under the ooze for a long winter’s snooze. 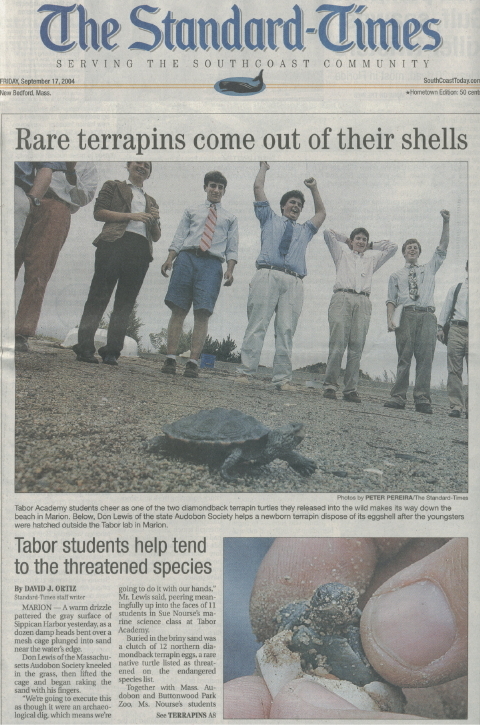 On June 3rd, 2002, we sampled terrapins in Wellfleet Bay’s prime mating aggregation: Chipman’s Cove. 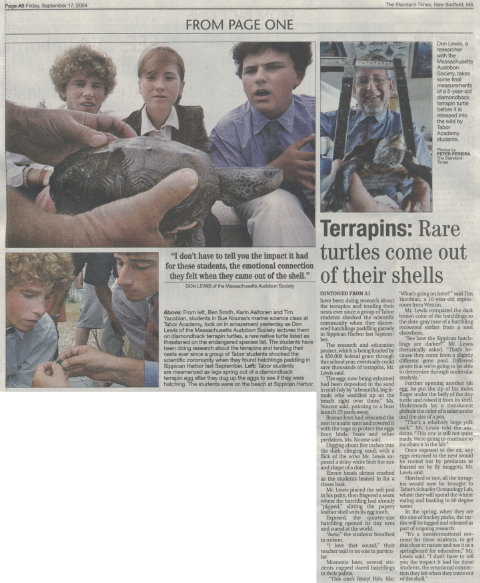 We netted ten female terrapins; nine were first time captures. Terrapin 829 proved the only recaptured turtle. Since we first saw her in September 1999, she had suffered traumatic shell damage to her front left quadrant, probably caused by an encounter with a boat. See Life After Celebrity originally published in Terrapin Diary and now posted on Turtle Journal. 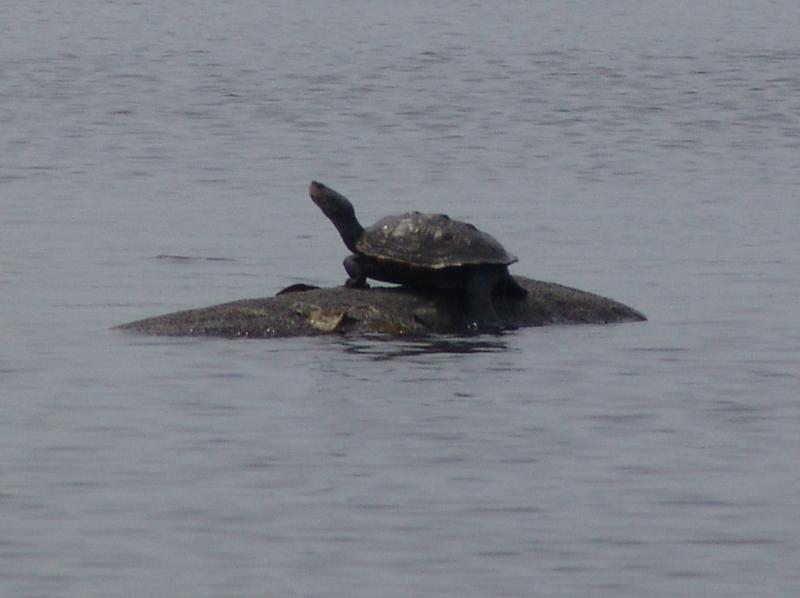 On Friday, May 16th, the Turtle Journal team visited the Chipman’s Cove mating aggregation for the first time in the 2014 season. 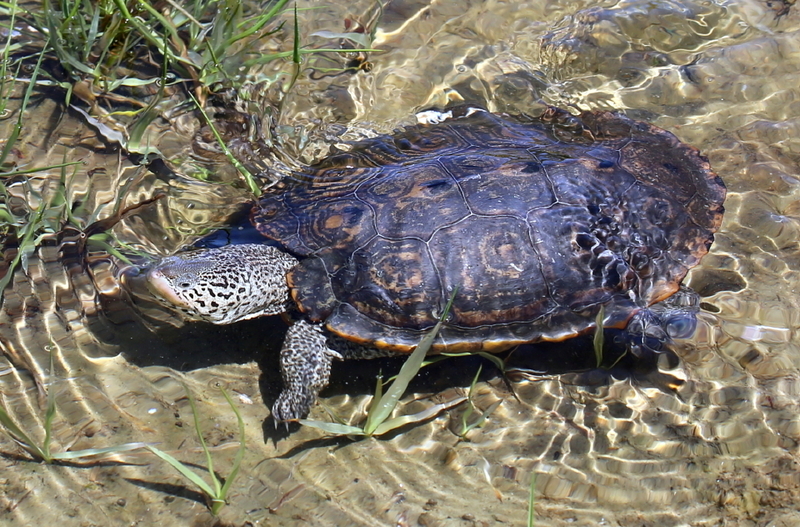 We waded into the flooding cove and hand-netted six diamondback terrapins: two recaptures and four first timers. 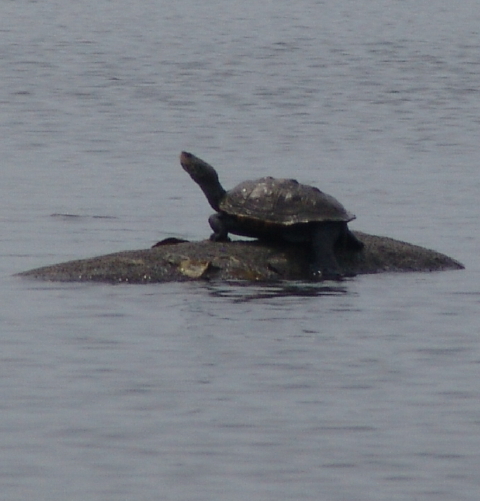 The very first turtle we netted was the quite distinctive Terrapin 829, easily recognizable by the injury to her left front marginal scutes. 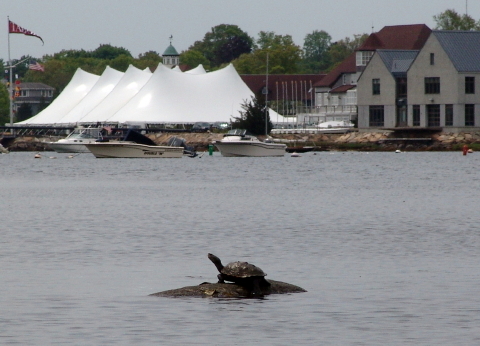 Terrapin 829 Still a Cover Girl Beauty at 45! 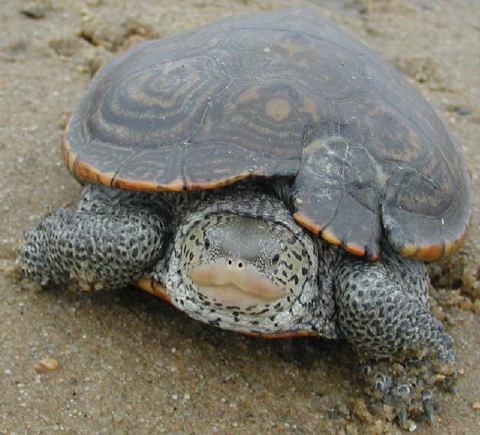 In 15 years Terrapin 829 has grown 25 millimeters in carapace and plastron lengths, while maintaining the same weight. 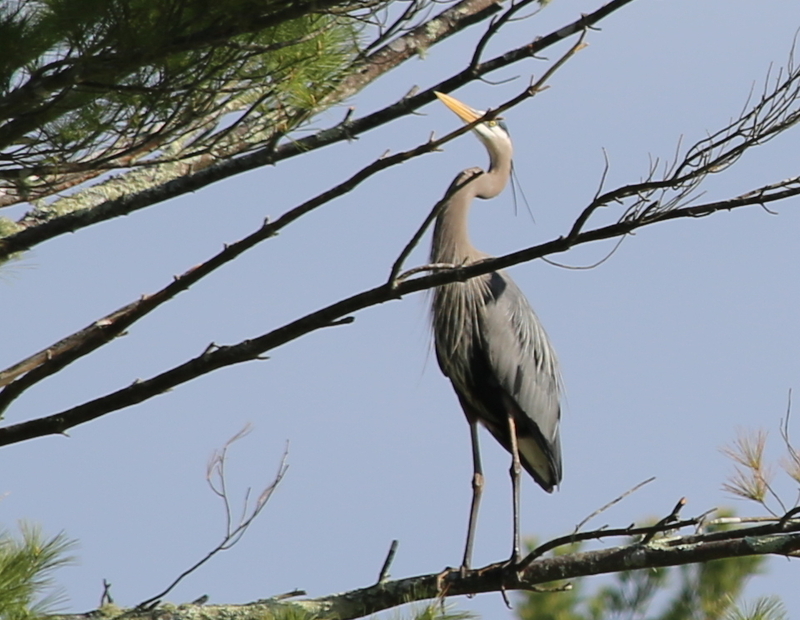 She’s still quite a beauty, especially when she shows her right profile and hides the cracked marginals. We suspect her recent glossy image will still grace many a publication and more than a few multimedia presentations. How hot is she? When we observed Terrapin 829 paddling through the shallows of the Chipman’s Cove mating aggregation on Friday, she was hotly pursued by a handsome male terrapin. 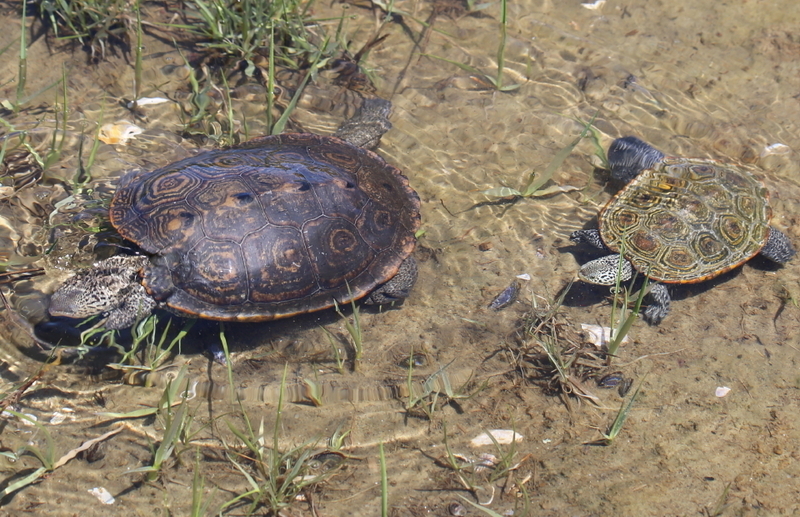 Note the gender dimorphism of diamondback terrapins illustrated by this pairing. Female Terrapin 829 weighs 3 pounds and is 7.8 inches long; the large mature male, #6103, weighs 2/3 pound and is 4.9 inches long. The Turtle Journal team had an opportunity to play a role in the life cycle of American eels (Anguilla rostrata) this weekend, to learn a lot about tiny elvers, to document the huge challenges to their survival, to engage in some hands on field research and discovery, to save a few hundred juveniles and to work towards smoothing the journey for new generations of American eels within the SouthCoast watershed. Like so much else in the natural world, we humans hold the future of this species in our own hands, just as Sue Wieber Nourse holds a tiny elver in her hand as we lift it past an obstacle to its survival. The epic journey of the American eel (Anguilla rostrata) is a literal ocean odyssey with few equals in the marine world. 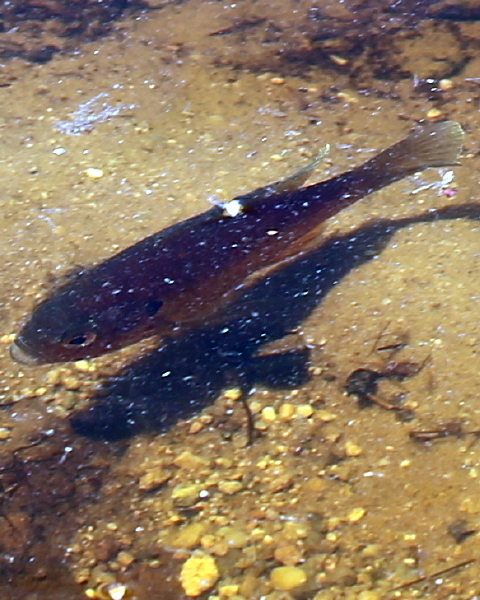 American eels spend their lives in fresh water ponds and estuaries on the East Coast of North America. 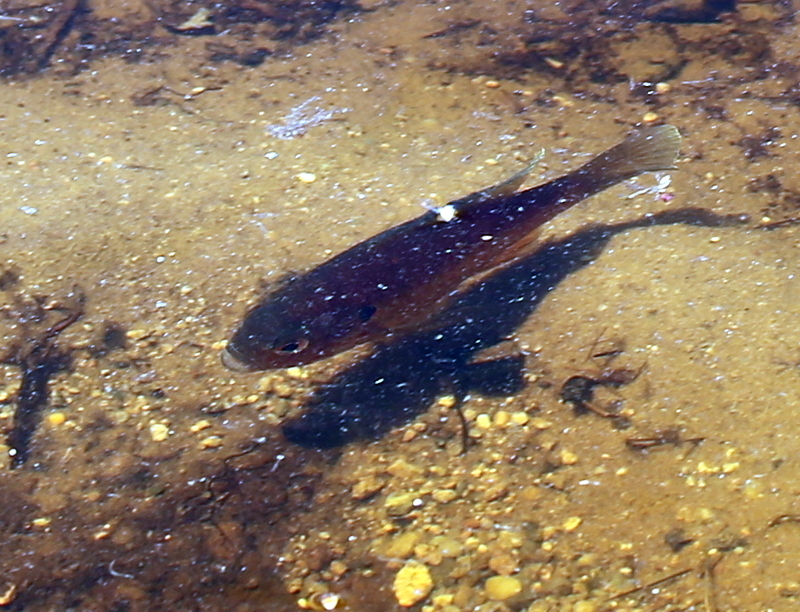 When the time comes, and eels can live long lives, mature adults leave the ponds where they spent their lives. 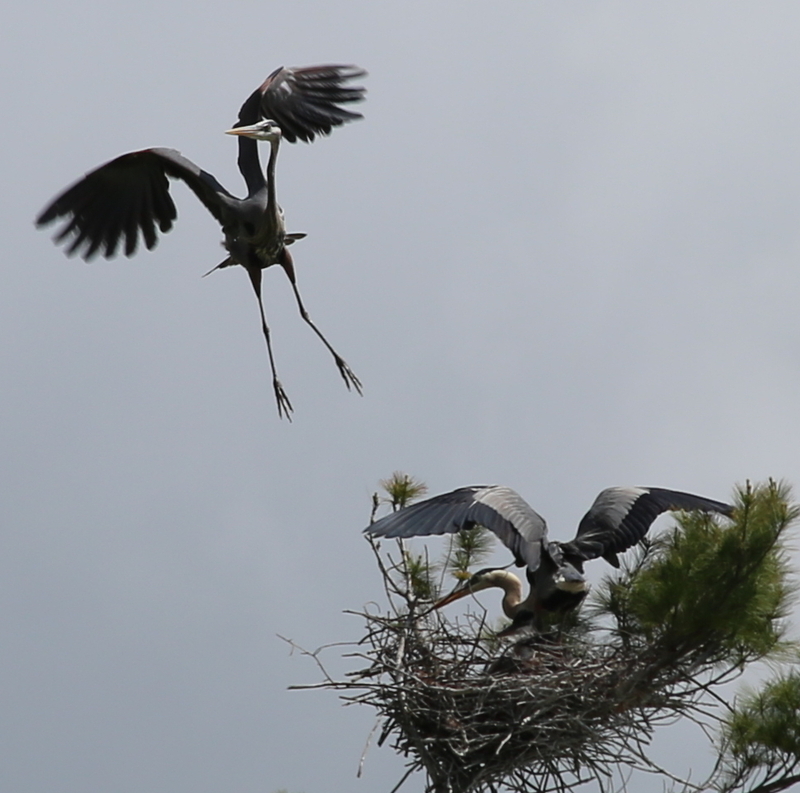 They slither through bog, creek and river to reach an estuary as they begin their long, long ocean journey to the Sargasso Sea. IF YOU HAVE AN iPAD & CAN’T SEE VIDEO, CLICK HERE. It’s a one way trip. 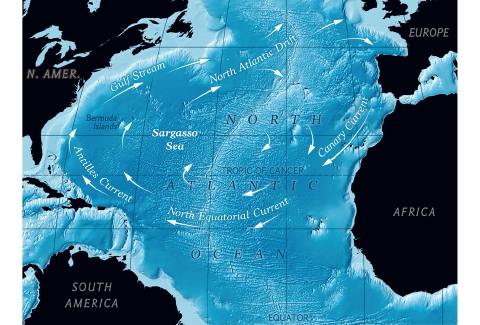 Adults will consume all their energy stores to produce and externally fertilize eggs in a giant spawning in the Sargasso Sea. 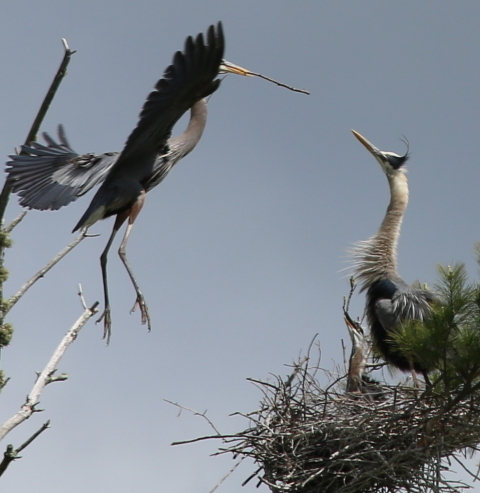 Each female can lay millions of eggs and dies after egg laying. When hatched, the larvae develop into leptocephali and float in the currents like tiny leaves, ever moving closer to North American shores where they metamorphose into glass eels. 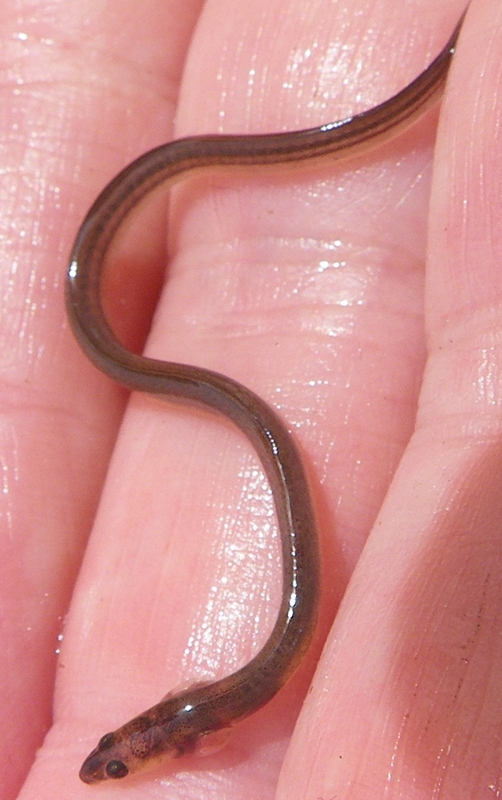 As they enter estuaries and fresh water systems, they develop pigment and become elvers. In this epic journey from Sargasso Sea in the middle of the Atlantic Ocean to a local SouthCoast pond, elvers must traverse enormous challenges, the most serious being obstacles erected by human development: dams, hydro-power systems, water control regimes, fast flowing culverts, flood control devices and so on. 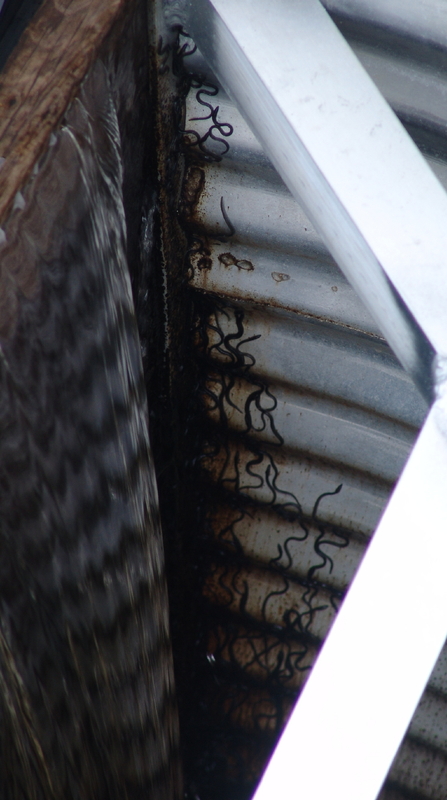 After a perilous trek of thousands of miles from the mid Atlantic ocean, tiny vulnerable elvers get stopped within inches of their goal by human contraptions for which evolution never prepared them. And that might be the journey’s tragic end were it not for their extraordinary tenacity and persistence … augmented with a critical assist from caring and knowledgeable locals. 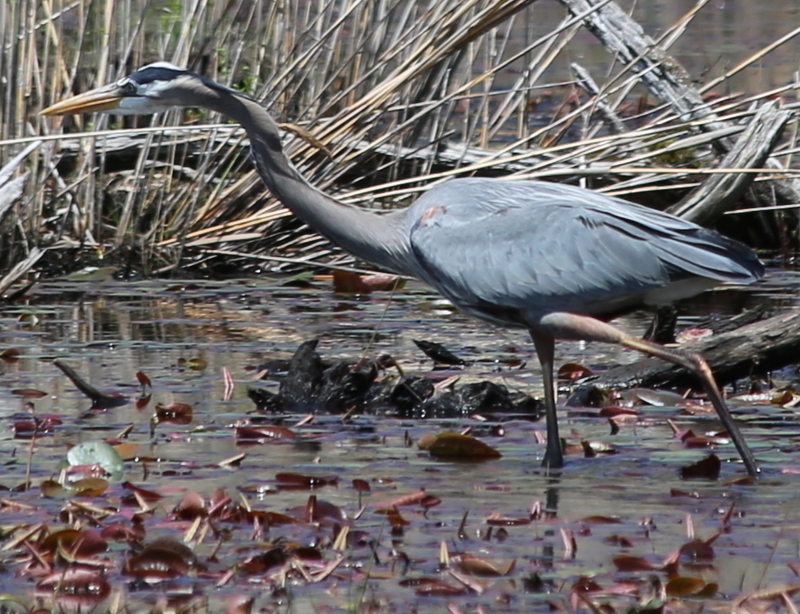 One such local planner called Turtle Journal on Friday, May 16th, to report that elvers had been sighted at a SouthCoast cranberry bog as they were trying to scale a 10-foot vertical water control device. On Saturday morning we visited the bog and found hundreds of tiny elvers wriggling up the vertical 10-foot device in an attempt to reach the fresh water pond where they would spend their lives. 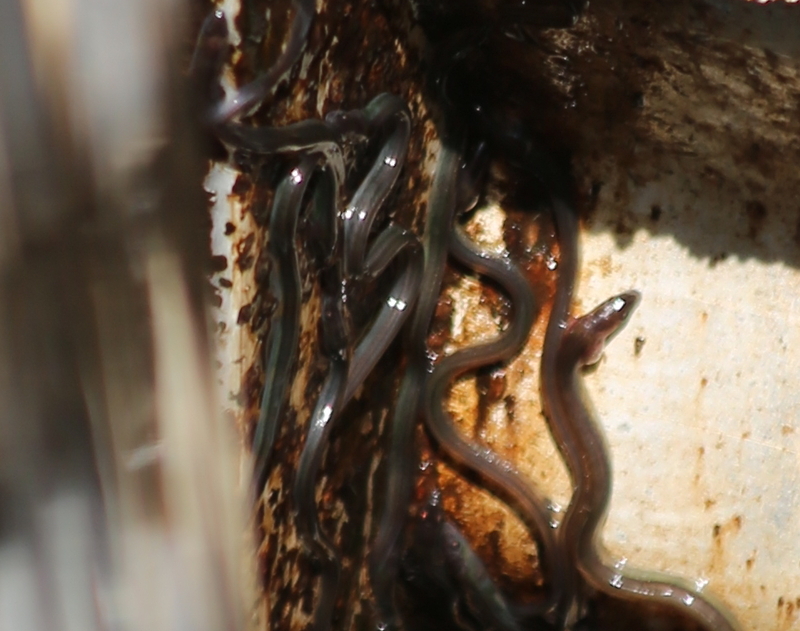 We documented the process, and later spoke with the bog operator about potential assists to facilitate the elvers’ passage through the water control device. 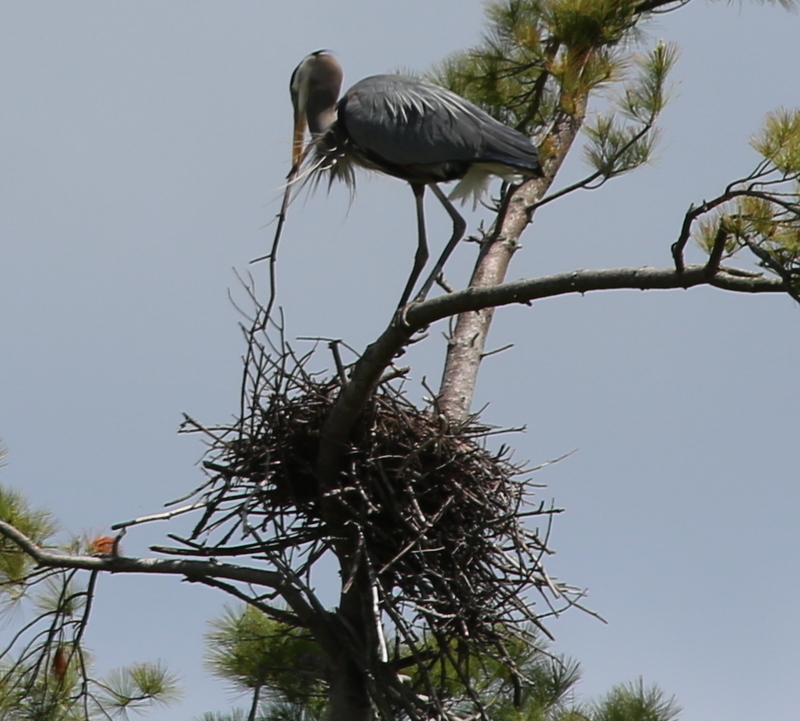 Years ago the bog operator had constructed a concrete and rock “ladder” with continuous water flow leading from the creek to the pond. We observed many elvers using this passage to reach the pond. 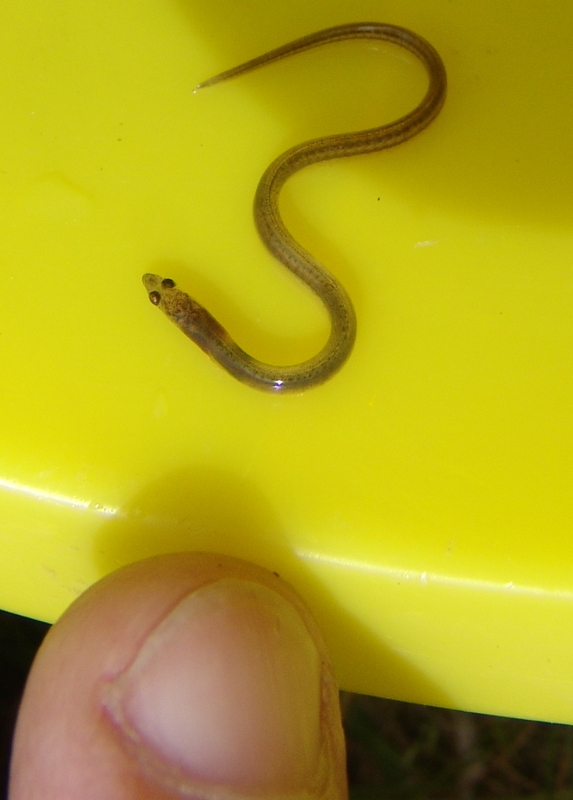 While no longer glass eels because they have become somewhat pigmented while moving through estuary and creek, the overwhelming number of elvers were quite small as indicated by the photograph above with a Don Lewis’ thumb to gauge sizing. 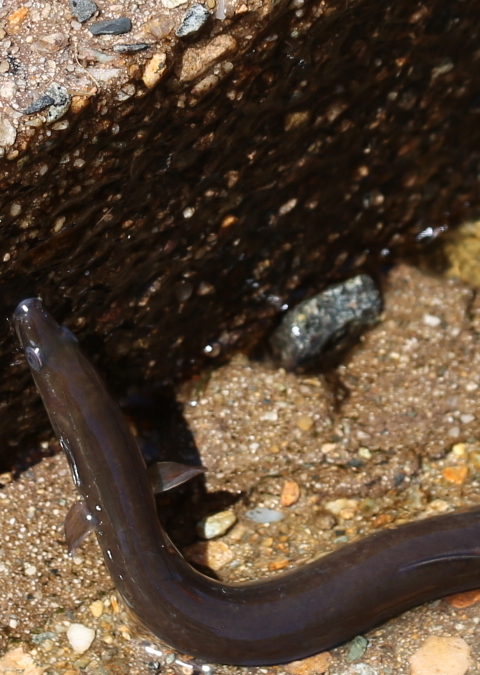 As we watched the concrete “ladder,” a large (~ 18 inch) American eel slithered up the stairs. 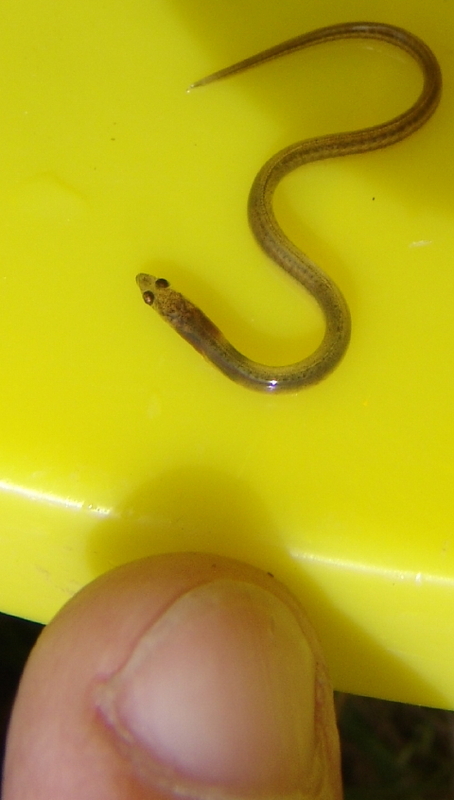 We suspect that at this stage of development it would be called a yellow eel. 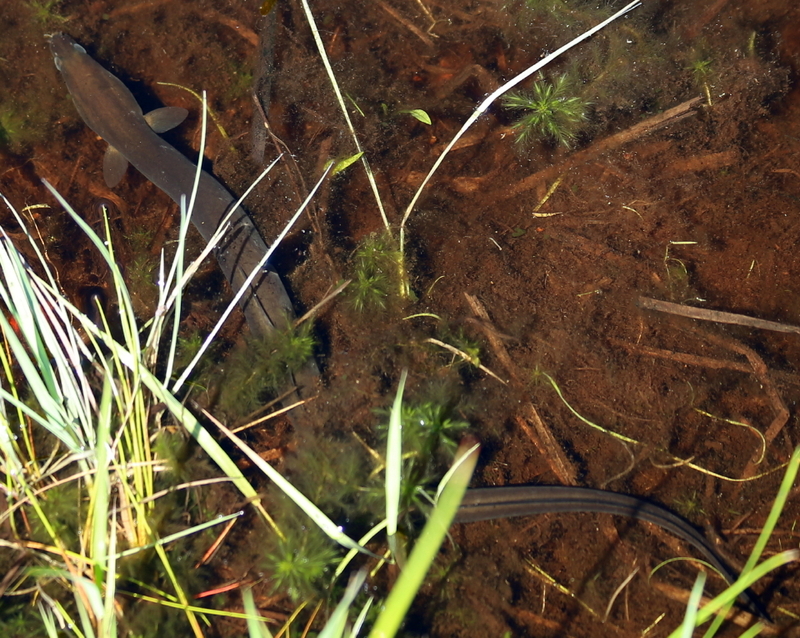 After climbing the concrete “ladder,” the eel slipped into the pond and lazily powered itself into deeper waters. 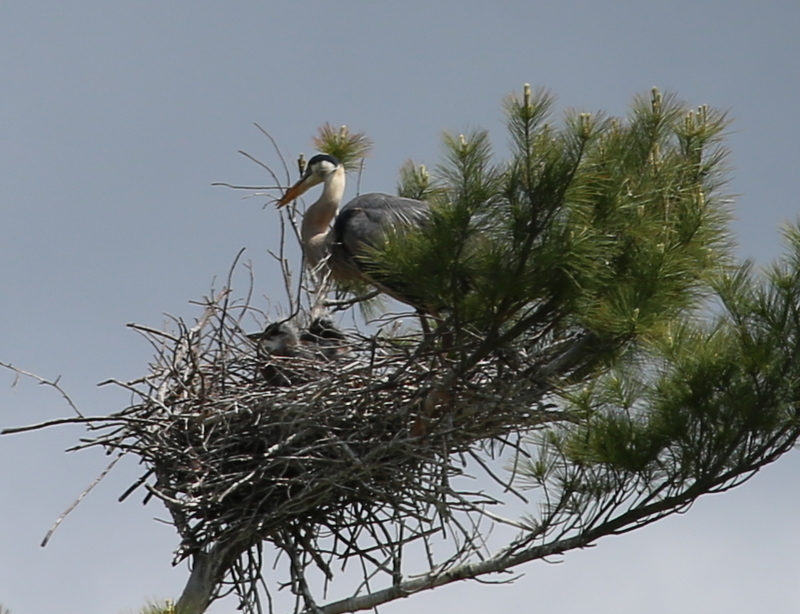 During the two hours we observed this ladder, elvers of various sizes and stages of development made the passage from creek to pond. First, they scaled a six foot tight rocky passage, then they completed the transition by climbing the wet concrete stairs. Saturday night we pored over watershed maps to trace the path from the bog to Buzzards Bay through Aucoot Cove and associated creeks, streams and bogs. 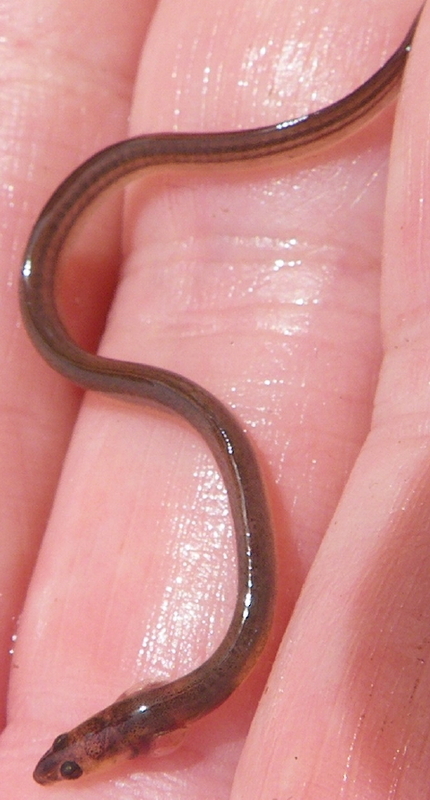 We identified the likely pathway for the elvers and highlighted a potential obstacle to their passage. 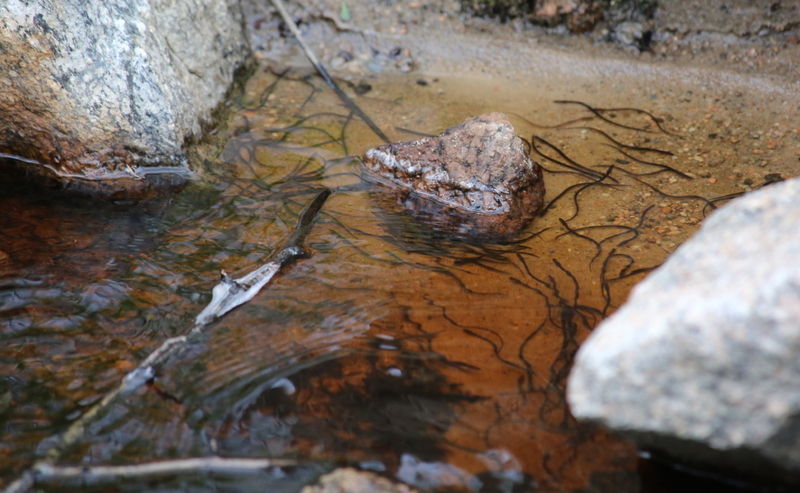 On Sunday we visited the site of the potential blockage, and Sue Wieber Nourse observed thousands of elvers backed up by a newly installed, gushing culvert. 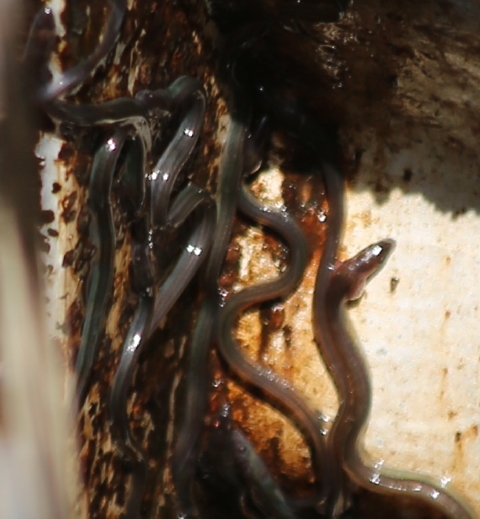 How many elvers were frustrated by the new culvert? 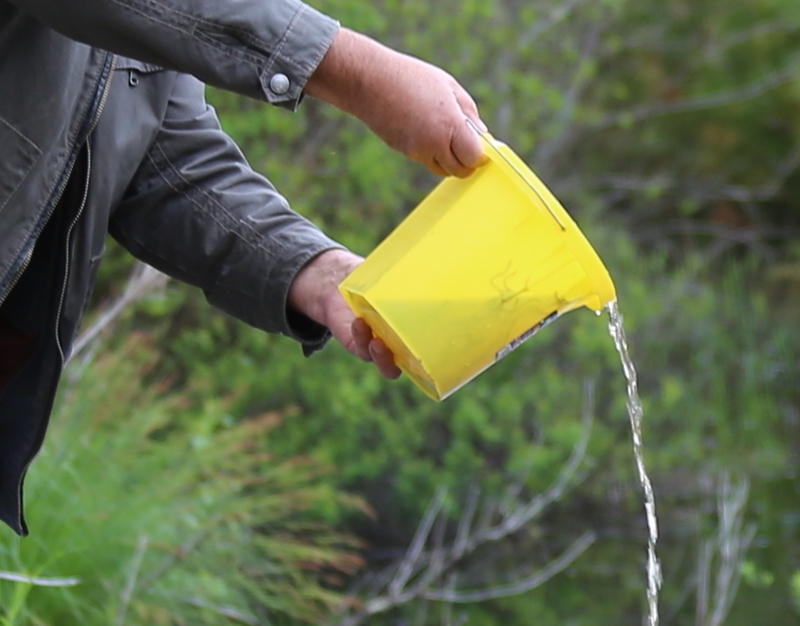 We dipped a half gallon pail into the creek and quickly pulled it out. 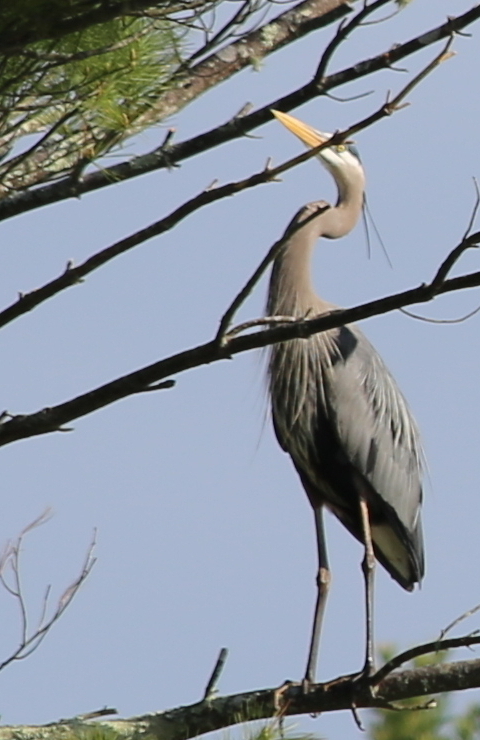 In that brief instant, a hundred tiny elvers flooded into the half filled pail. We contacted the planner for the site immediately, alerted him to the situation and talked about potential quick and long term fixes. Alas, we still had our 100 elver bucket. It reminded me of the story of the old man (or sometimes a young girl) and a beach full of starfish. 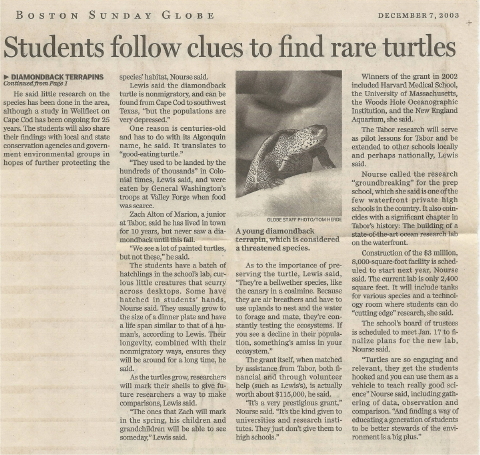 If you’d like to read a version of this story, click here. 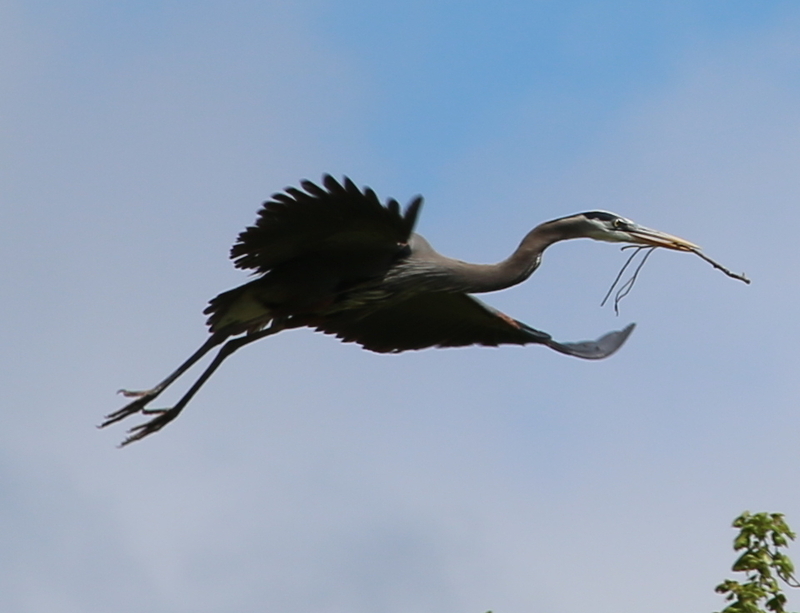 Yes, we couldn’t help every elver make that passage from creek to pond. But we sure could give a huge boost to the 100 elvers in our plastic sampling bucket. If just one or two or five or ten of those 100 elvers made it back to the Sargasso Sea and laid millions of eggs … Well, perhaps our quixotic gesture wasn’t as foolish as we originally thought. 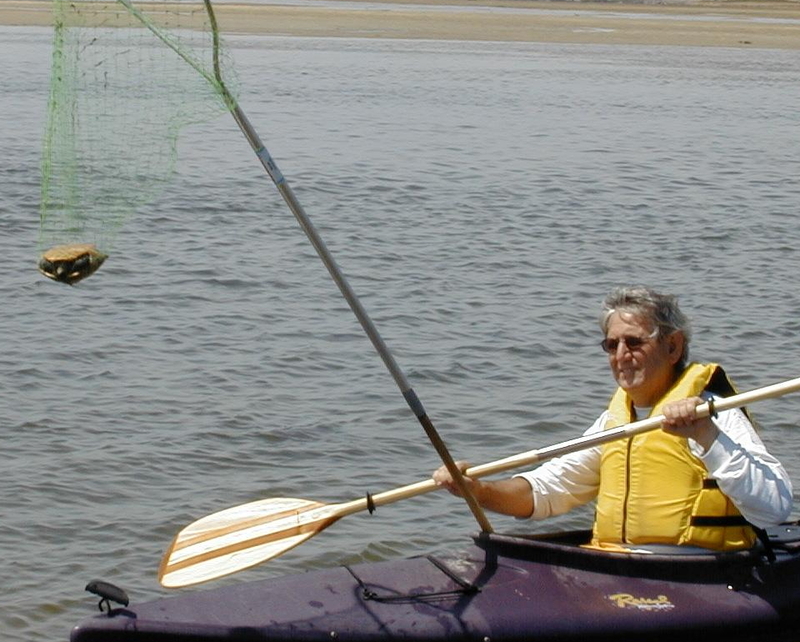 In fact, since we’re saving the world one turtle at a time, maybe we can save the world one yellow elver bucket at a time, too. 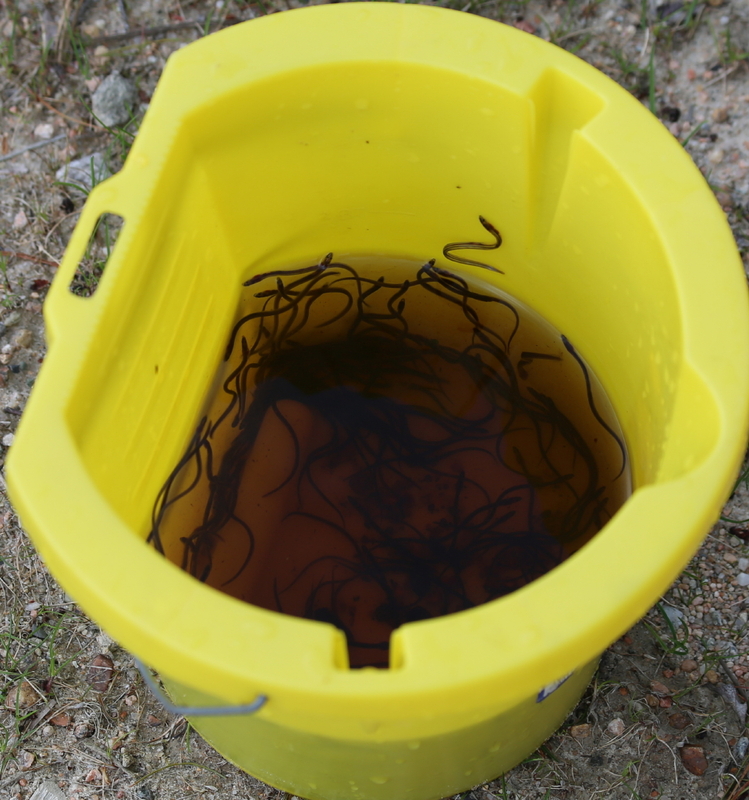 We lugged the bucket across the trail to the pond and poured 100 elvers into their new home. 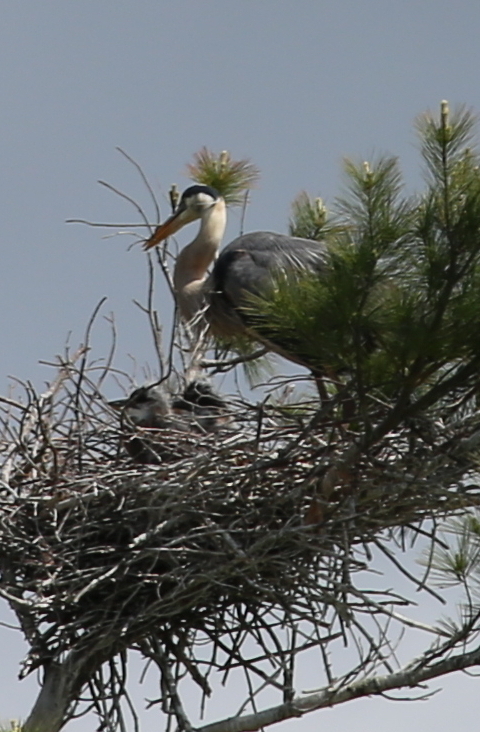 We Have Great Blue Heron Babies! 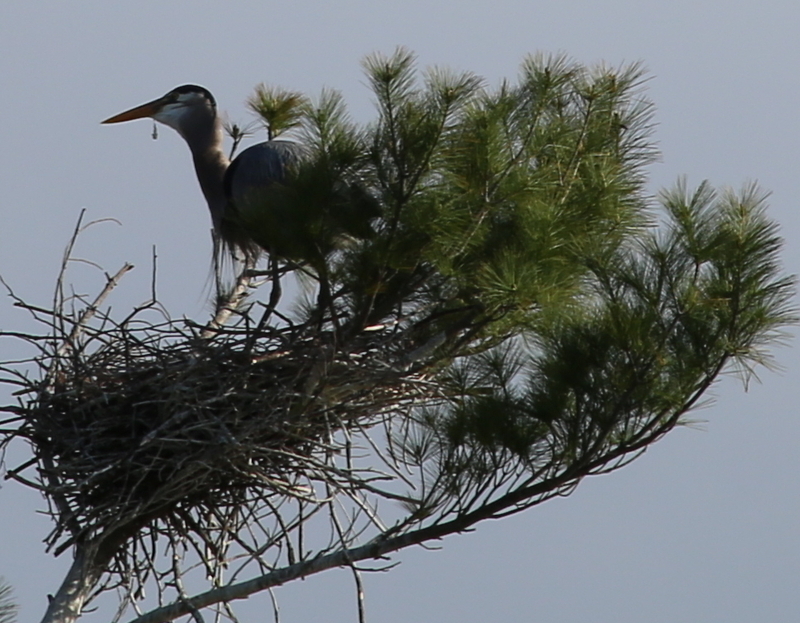 As the Turtle Journal team approached the SouthCoast rookery this morning we heard the unmistakable nattering of newborn great blue heron chicks echoing from their treetop nest. 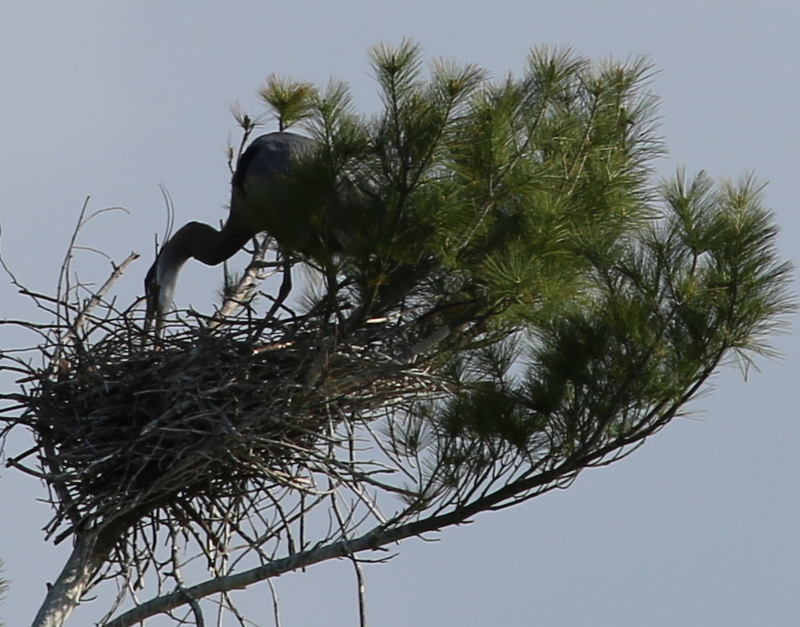 The male heron, evicted for the babies, stands on a branch under the nest, staring up at the noisy kids that chatter persistently, insistently and incessantly for attention. 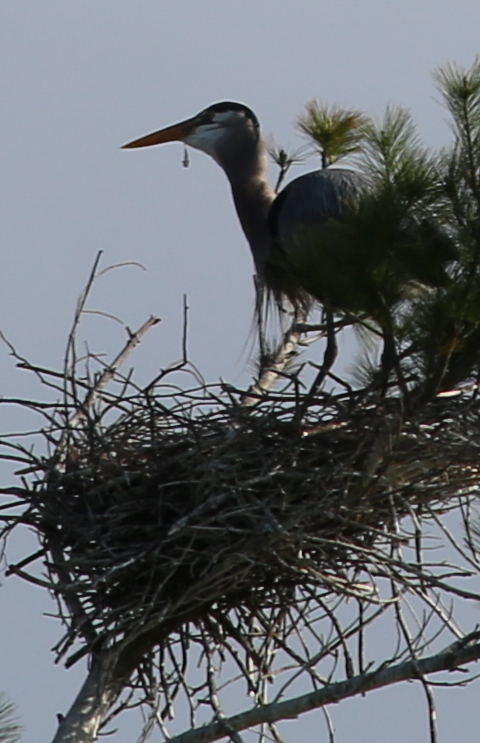 The male had just brought a freshly caught pond fish to the nest for momma to distribute. 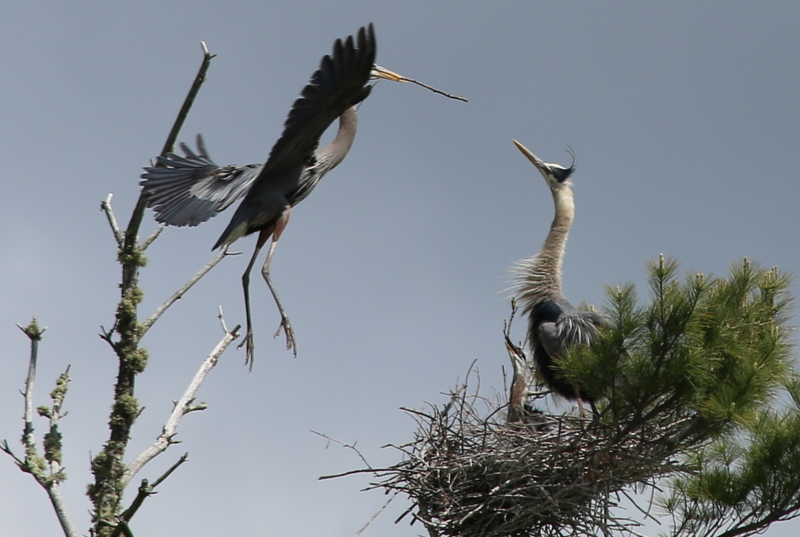 The female great blue heron tiptoes around the chattering chicks, picks up the fish, and begins processing it for the babies. 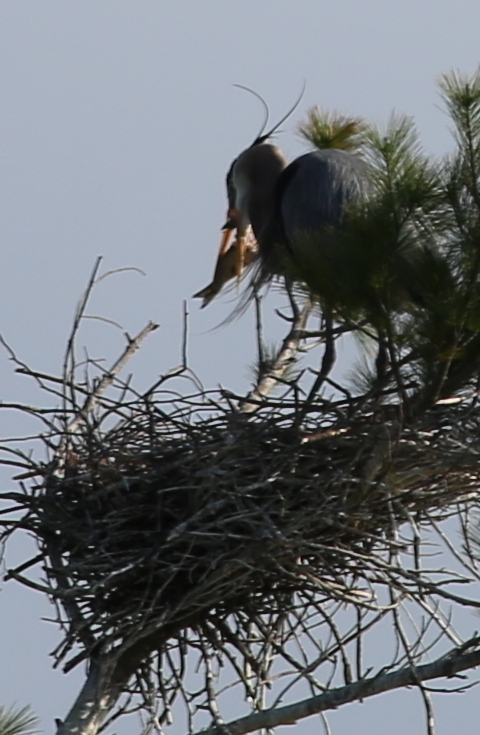 She swallows the fish to predigest it for the babies. Then, after a few minutes, she shares the regurgitated fish with her pleading chicks. 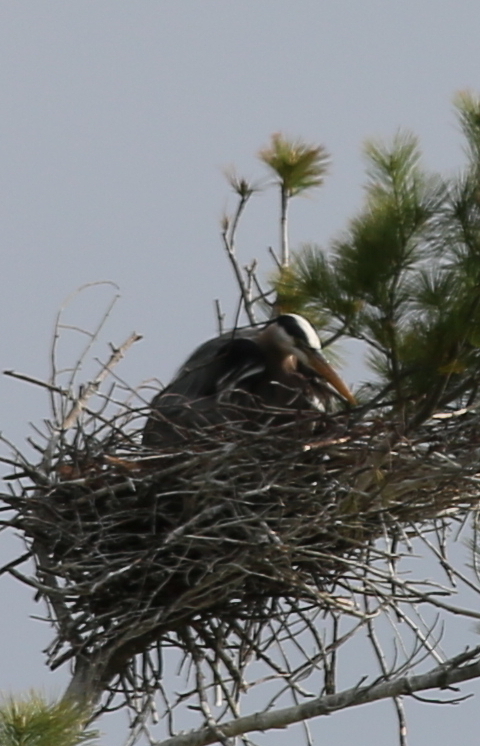 Once the sated kids quiet down, the female great blue heron settles in the nest with her resting brood beneath her. 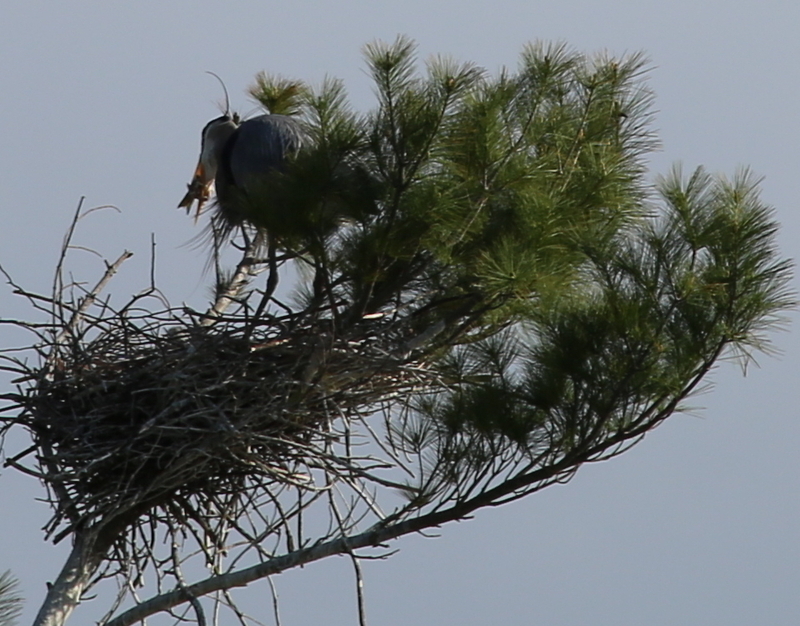 But there is no rest for the male great blue heron. 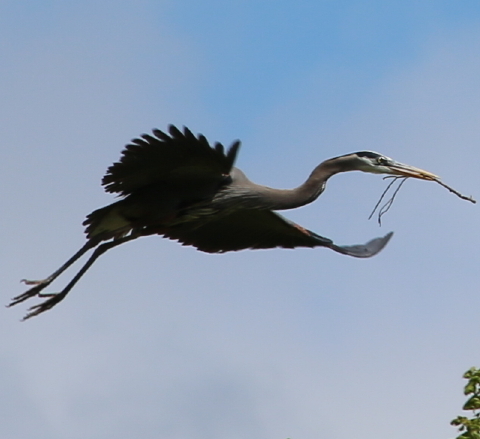 As momma feeds the babies, he glides down to the pond to hunt for more fish to satisfy the chicks when they begin to lobby for attention once again. 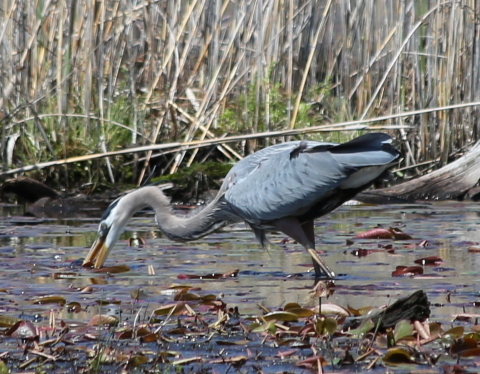 The male great blue heron moves with delicate stealth as his eyes scan the murky shallows for movement. 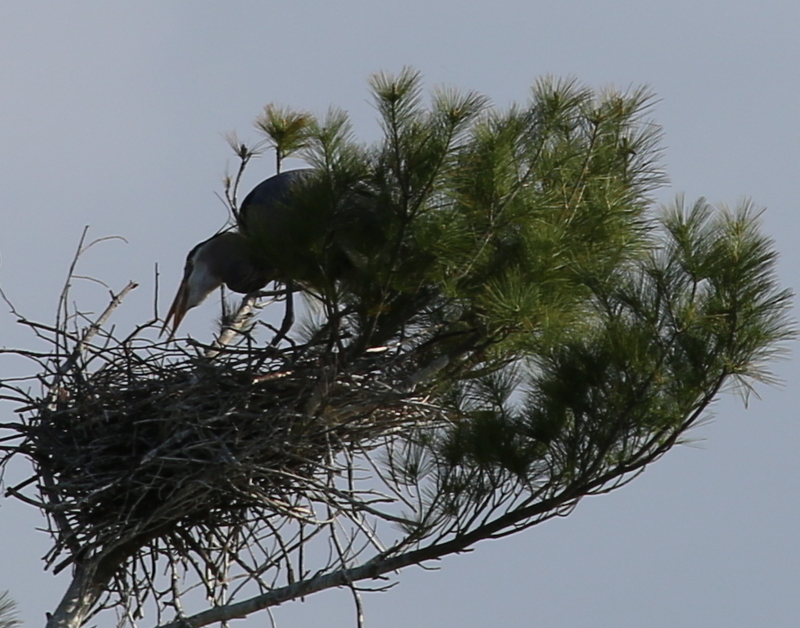 The pond surrounding the rookery is filled with fresh water fish of just the right size for great blue herons. 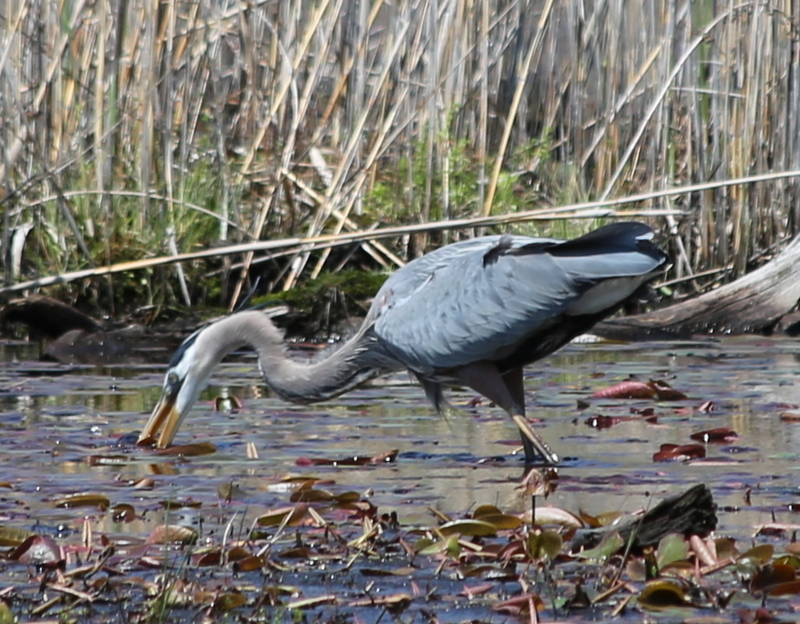 The hunting heron spots his prey and stabs quickly at the water with open beak. Success! 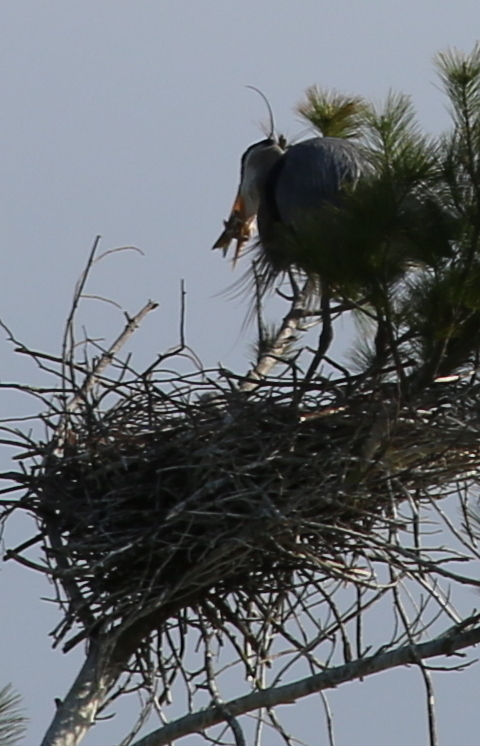 The great blue heron catches another fish for his hungry family. You are currently browsing the Turtle Journal blog archives for May, 2014.